This punch art snowman and Christmas tree is one of my favorite Christmas projects even though it didn't turn out the way I originally planned. I started to make the tree using Stampin' Up! 's Seasons of Cheer Designer Series Paper and didn't like the way the paper looked cut up into strips. I ended up changing the colors to fit the Bohemian Designer Series Paper and loved the results. It's a good thing I like all different color combinations for Christmas! You can see the details for the punch art snowman in this video. The punch art snowman was inspired by Lisa Curcio. I changed up a few things to fit Stampin' Up! 's current punches. Here are the instructions including a video tutorial for the Christmas Tree from a card I did last year. Because the tree in this project is a little shorter than one on the card, the strips of designer series paper are only 5/8". 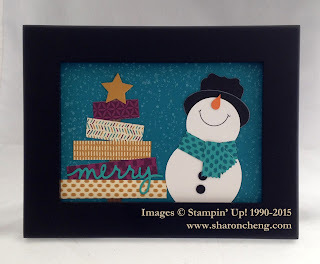 Check out my other November Creative Crew Challenge projects for Splitcoaststampers.